A school in Bolton has come up with a novel way of combining classes in history and design and technology with sport and physical education by introducing ‘bring your wheels to school day’. Beaumont Primary School encouraged Year 2 pupils to bring in the wheeled vehicle of their choice to help inspire their lessons in historical transport and journeys which have been taking place this term. 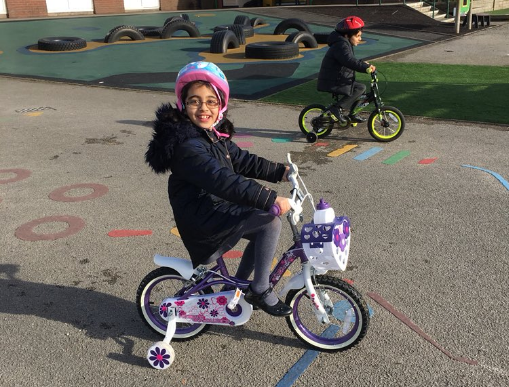 The pupils responded enthusiastically by bringing in a range of their own forms of transport, including bikes, scooters and ‘Heelys’ – shoes with rollers or wheels in the sole of the foot. The school is an active participant in the School Games, a government led programme funded by Sport England through the National Lottery and delivered by the Youth Sport Trust, and will be hosting their annual School Games Day this summer. Beaumont have received a bronze School Games Mark Award for the last two years, in recognition of their school sport provision, but with more innovative ideas such as this could well be surpassing their already high standards they have set for themselves in the coming months. Ms Myers is already hoping to run a similar event next year after seeing how much the children enjoyed their day of being active and sharing their skills. There are also plans in place for the pupils to take part in ‘Bikeability’, a Department for Transport programme delivered in partnership with Youth Sport Trust, enabling pupils to gain practical cycling skills and an understanding of how to cycle safely on today's roads. With more pressure than ever on schools to focus on exam results, rather than physical activity and the health and wellbeing benefits which come with targeting 60 minutes of activity a day, it’s more plans like this that will help pupils get out of the classroom and inspire the next generation of young people. No doubt there will be a few more wheeled vehicles on birthday wish lists in Bolton this year!